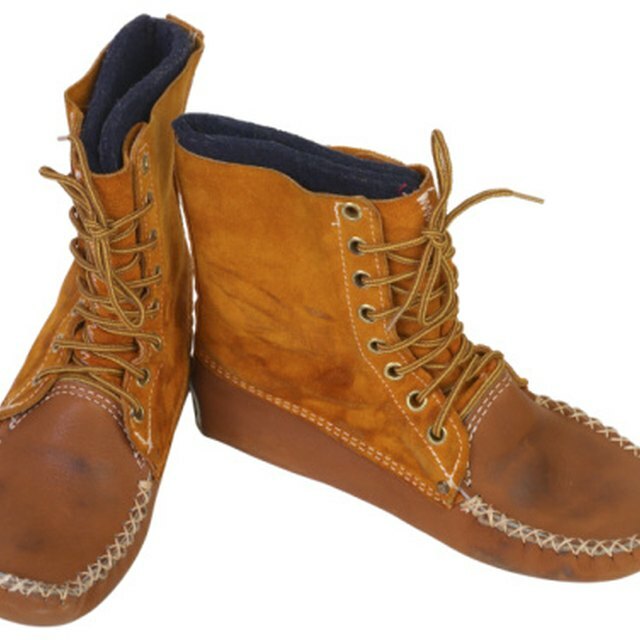 The advantage of making moccasins out of deer skin as opposed to some other type of leather is that the deerskin is extremely soft and feels incredible against bare skin. If you are a deer hunter, your homemade moccasin can be away of displaying your hunting prowess. After skinning your deer, take the skin to a leather tanner’s to be preserved. Make sure that you tell the tanner what you will be using the skin for and also let him know that you need to have one piece with the hair still on the deer skin so that you can add fur to your moccasins. Use your moccasin pattern, and cut the deer skin into the pieces you need. When you are done you should have six separate pieces, three for each foot. Pick up the bit of deer skin that is going to be the vamp. The vamp is the part of the moccasin that stretches across the top of your foot. Using a whip stitch, sew the vamp to the piece that will be your moccasin sole. Make sure that the wedge (the part that reinforces the toe) is tucked in between the vamp and the sole when you start to sew. The easiest way to sew your moccasins together is to turn the pieces inside out; when your done sewing you can turn them right side in. You will use your leather thread for this step. Still using a whip stitch, sew the lining together. When the lining is assembled it will resembled a slipper. This step requires the use of your regular sewing thread. Most people use their sewing machine for the lining because it’s quicker than sewing by hand. Pull the lining onto your foot, and than slide your foot into the moccasin. Make sure everything feels comfortable. Very carefully remove your foot from the moccasin and try to keep the lining tucked into the deerskin. This may take several tries. Trim the top of the lining so that it matches with the top of the deer skin. Baste the lining to the deer skin. Measure the circumference of your moccasin’s foot hole (the part you slip your foot into). You will want to cut a strip of fur long enough to go around the foot hole. Starting at the right side of your moccasins, use a whip stitch to attach the fur to the deer skin.